says "Happy Phirr Bhag Jayegi is a Bollywood comedy film directed by Mudassar Aziz. The film is a sequel to Happy Bhag Jayegi (2016). It stars Diana Penty returning as the eponymous character and Sonakshi Sinha. The production features an ensemble cast consisting of Penty, Sinha, Jimmy Sheirgill, Ali Fazal, Jassi Gill." to get instant updates about 'Happy Phirr Bhag Jayegi' on your MyPage. Meet other similar minded people. Its Free! happy phirr bhag jayegi says "Happy Phirr Bhag Jayegi is a Bollywood comedy film directed by Mudassar Aziz. The film is a sequel to Happy Bhag Jayegi (2016). It stars Diana Penty returning as the eponymous character and Sonakshi Sinha. The production features an ensemble cast consisting of Penty, Sinha, Jimmy Sheirgill, Ali Fazal, Jassi Gill." 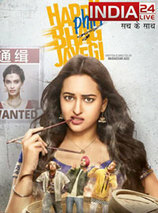 Happy Phirr Bhag Jayegi is a Bollywood comedy film directed by Mudassar Aziz. The film is a sequel to Happy Bhag Jayegi (2016). It stars Diana Penty returning as the eponymous character and Sonakshi Sinha. The production features an ensemble cast consisting of Penty, Sinha, Jimmy Sheirgill, Ali Fazal, Jassi Gill.